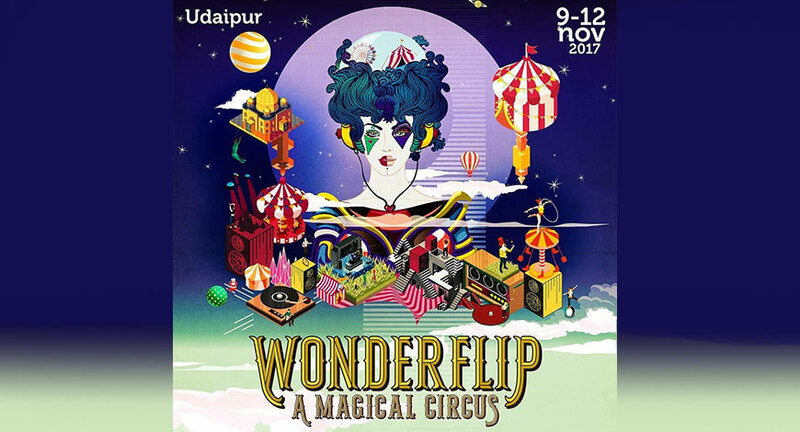 India’s first performing arts and music festival, ‘Wonderflip’, will be held in rustic, rural Khempur, a 45-minute drive away from Udaipur. The festival has now revealed the line-up of DJ’s and Live Bands, that will be performing on the grounds of the Haveli, known from the Hollywood blockbuster “The Best Exotic Marigold Hotel”, from the 9th-12th of November 2017. Two music stages, ‘The Big Top’ and ‘The Marquee’ will host artists, both live and electronic, from India and abroad. The international DJ Line-up includes the likes of Patrice Baumel, the internationally renowned DJ from Amsterdam known for its electronic music; Eagles And Butterflies, known for downtempo to techno to house, with releases on Innervisions, Exit Strategy and his new imprint Art Imitating Life, remixing artists like Underworld, RY X, Moby and Ludovico Einaudi, he continues to be the toast of the underground; Frankey & Sandrino, received the award “Track of the season” at the Ibiza DJ Awards and their remix of "The Idea" (by Hyenah) on Freerange Records is the most charted track on Resident Advisor; ATMOS with his 20 years of experience will turn on the groove with his version of progressive trance and electronica; VAAL’s stirring, emotive productions have crushed dance floors across the globe, delivering spine-tingling melodies and morose atmospherics to hundreds of thousands of loyal followers; DOP (Live), ranked the third best live act of 2010 by Resident Advisor, the French trio (Clement Zemtsov programming beats, Damien Van de Sande playing keyboards and horns and Jonathan "JoJo" Illel on vocals) will reinvent dance floor music and will be joined by Aeden and Kimou. The Indian DJ line up is geared up with Ankytrixx, winner of “DJ of the year” & ranked No.1 in India for Electronic Music (2012,2013) on the MyFavDj Poll; Bullz Eye, who started DJ'ing in 1999 at the age of 16 under the influence of Sasha, Paul Oakenfold, Bedrock, Siddhanth, has played in many clubs in Mumbai; 8-Bit-Culprit, is a valuable asset to the growing Indian electronic music culture; Calm Chor, the co-founders of Jalebee Cartel, co-founder at Soupherb records and one half of electronica duo Bit Of Both; SHFT aka New Delhi-based techno DJ and producer Vipul Angirish makes music that is boundless, with a sound that’s both clean and effervescent. Hamza featuring Manu Idhra, his diverse international sound is influenced from his musical background as well as growing up in India and traveling the world, living in Paris, Boston, and New York. The Live band line up at Wonderflip features some of the most experimental artists. The international live bands line up features Gipsy Sound Revolution, who celebrate gypsy migration out of India; Gaudi Live featuring Danny Ladwa’s past career highlights include working alongside ‘Supa Mc TC Islam’ (son of Afrika Bambaataa) at ‘EcoSystem Festival’ in Brazil, joining Hip Hop fusion band ‘NOU’ (One Little Indian Records) in Brighton for their UK tour, and winning a place in the UK Beatbox Championship Final; The Indian live band line up will feature The Funcolos, whose set is a mixture of high energy SKA, dub, reggae, funk and even more high-energy SKA! The main focus of this 5-piece band is live performance and audience interaction. Singers, songwriters and producers Hari and Sukmani have created sounds by fusing traditional punjabi folk music with ambient electronica embodying their powerful, singular and independent spirit. Komorebi, Delhi-based Indo-Canadian pianist - Tarana Marwah does a mix of electronic music, with Suyash Gabriel on drums; Clown with a Frown set out to redefine dance music, by revolutionizing sounds from the 70's disco era. The band draws influences from a wide array of artistes like Chic, Jamiroquai, Earth Wind & Fire, Kool & the Gang, Steely Dan, Tower of Power and many others; GRAIN aka Gaurav Raina is one half of India’s biggest electronica export – Midival Punditz. After over a decade and a half of Midival Punditz, Gaurav’s solo project – GRAIN is about going back to the roots and producing quality music; The Chizai Quartet - More than being a band, Chizai is a group of friends that came together to cheer on the spirit of life and spread good vibes. Renowned dance company Natya Nectar Dance will also stage their talents at the event. The Wonderflip themes in the order of the three days are “Vintage Circus”, “Salvador Dali” and “Fairyland”. The early bird tickets are out and priced at INR 10,500 and Mughal inspired Luxury tents are priced at INR 26,500 for two and INR 30,500 for three. Tickets can be booked at www.wonderflipcircus.com.